This route is packed with options for family activities and also a rich mixture of canal scenery, & can include visits to The Sea Life centre in Birmingham(mooring outside), Dudley Zoo & castle, Drayton Manor Theme Park, & the Black Country 26 acre outdoor Museum, Cadbury World at Bournville, & the Snowdome at Tamworth. Shopping in the Bullring in Birmingham & the lovely town of Stafford. Note that visits to these attractions will require a longer stay! 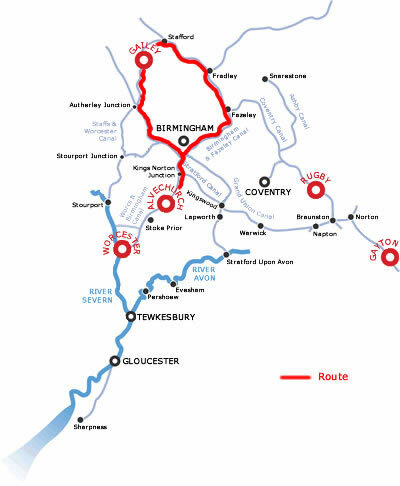 Once setting off from Alvechurch, you soon leave the traffic behind and cruise through lovely Worcestershire countryside to your 1st Tunnel at Wast Hills which at 2726 yards is one of the longest in the country! For your 1st nights stop it is nice to cruise for an hour to Hopwood and then stop by bridge 67 where there is a convenient pub- The Hopwood House, by the Canal. Continuing on through the Tunnel, for those with children you might want to stop at the visitor moorings at Bournville the home of Cadbury World, which is 1 mile north of the Kings Norton Junction (booking is advisable Tel. 0844 8807667 ).It is signposted from the canal. There is an exhibition dedicated to the history of chocolate, audio visual displays, Victorian Birmingham and a Jungle to explore! About 3 miles later you arrive at the Gas Street basin which is in the heart of Birmingham's canal network, it has been has been redeveloped into a unique experience where traditional narrow boats moor up next to cosmopolitan cafes and bars. The surrounding area is a vibrant arts and entertainment area and there are many shopping options within a short walk. You can also moor at the Cambrian Wharf by the Sea life Centre which might be slightly quieter. Go past the Gas Street Basin and turn right at Deep Cuttings Junction, the Cambrian Wharf is by the Sea Life Centre. Amongst some of the attractions are the National Sea Life Centre and the Jewellery Quarter Discovery centre, also many fine Art galleries and over 500 restaurants offering every choice of food! Close by is the National Indoor Arena, one of the busiest large scale indoor sporting and entertainment venues in Europe. Total cruising hours from Alvechurch to Gas Street basin is 4 ¾ hours. From this point the locks fall steeply away from the heart of Birmingham, you will soon encounter the Farmer's bridge flight of 13 locks, where you will need a BW anti vandal key. At Aston Junction continue left and northwards where you encounter the Aston flight of locks which takes the canal down 11 locks to Salford Junction. All shops are readily available alongside the canal beyond Salford, a good access point is where the A452 crosses the canal at Tyburn bridge. It is 9 hours cruising from the Gas street basin so a useful place to stop for the night. As the canal descends towards Fazeley it loses the industry that has accompanied it since Birmingham. Beyond Curdworth Tunnel and the M6 motorway, the canal continues to Fazeley in complete isolation through empty fields, only the 11 locks falling to Fazeley junction breaking the journey. At Bodymoor Heath is a lovely pub- the Dog & Doublet by Cheatles Farm bridge. To the right is Kingsbury Water Park, a 600 acre landscaped park containing 30 lakes from old gravel pits. There are walks, nature trails, fishing, horse riding, sailing and wind surfing and power boating. There is also a childrens farm at broomey Croft near Kingsbury Swivel bridge. Just beyond that is Drayton Manor Theme park to the left of the road. It has 15 acres of serious rides so a definite day out for the children, also for the smaller children there is Thomas Land, and for all there is a Zoo to look around. In the evening it might be worth getting a Taxi into nearby Tamworth and visit the Snowdome, where you can ski, snowboard or toboggan on real snow, see website. At Fazeley Junction the Coventry Canal meets the Birmingham & Fazeley, turn a sharp left and you will pass Peels Wharf. This all gives way to lightly wooded open fields towards Hopwas Hill as the Canal follows the course of the River Tame very closely, passing below Hopwas village. Hopwas is a pretty & tidy village with a green, built on the side of a hill. It has a PO, and a convenience store. On the Canal is the Tame Otter Pub, where real ale & food are served all day, there are moorings available, also here is the Red Lion, food at lunch and in the evenings, steaks are a speciality. Just beyond here there is a delightful wooded stretch that covers the side of the hill. Landing is forbidden because these are the Whittington Firing Ranges. After the wood the canal continues in a side cut embankment with a view of Tamworth to the east. The next village you will reach is Whittington. There is a PO stores, garage, chemist, Chinese takeaway & off licence. The village centre is to the west of Whittington bridge, the shops are best approached from bridge 78. There are 3 pubs here, The Swan Inn on the Canalside, and the Bell Inn & Dog Inn in the main street. From here you can catch a bus into Lichfield, which is well worth the detour. The three spires of the 13th century Cathedral in Lichfield, the 'Ladies of the Vale' are a visible landmark for miles around. The modern shopping centre contrasts sharply with the graceful Georgian buildings of the city centre. There are excellent pubs & restaurants and night clubs, with a Farmers market on Sundays. You can also catch a train into the centre of Birmingham from Litchfield. Between Whittington & bridge 78, the Birmingham & Fazeley Canal changes to the Coventry Canal. At Huddlesford is the junction with the Wyrley & Essington Canal, now only used for private moorings. There is an award winning friendly canalside pub here, - The Plough serving real ale & good food. You can walk the 1- 2 miles to Lichfield. It is worth mooring here for the night as it is 9 hours cruising from Minworth. The Canal runs northward through flat open country and a swing bridge announces your arrival at Fradley Junction, where you meet the Trent & Mersey canal. There is a boatyard here, a british Waterways information centre and cafe, and a very popular pub, The Swan – reputedly one of the most photographed pubs in the country. It is in a 200 yr old listed building, with cosy fires, real ales, and good bar meals with a carvery on Sundays. You arrive on the Trent & Mersey in the middle of a 5-lock flight. Also nearby & good for kids to unwind is the Fradley pool Nature reserve, with lots of walks quite close to the Canal. The canal soon enters quiet countryside until it gets to the village of Handsacre. There is useful store 500 yards south of bridge 59, and a fish and chip shop and a cafe near bridge 58. The net village is Armitage and there is a very popular restaurant called Tom Cobleighs Spode Cottage, also the Plum Pudding Pub is canalside, and the Ash tree at bridge 62. You pass on your left Spode House, a former home of the pottery family. The huge chimneys of Rugeley Power station come into view, there are pleasant moorings by bridge 66 with the town centre and shops just a short walk away. Cannock chase to the south covers an area of 26 miles and has been designated an area of outstanding natural beauty. Near the Sherlock valley are German war graves from the 1st and 2nd World wars. The museum of Cannock Chase illustrate the life of the Chase, from medieval times to a 19th century colliery. To the south of Wolseley bridge is a pub, indian restaurant, and antique, craft & garden centre. The village of Little Haywood is off to the right, but a good place to moor up for the night is before Haywood Lock, with lovely views of Shugborough Hall. Shugborough Hall dates from 1693 and belonged to the Earl of Lichfields family. The estate is now managed by Staffordshire County Council and is open during the season. You can look around the Mansion, servants quarters, walled garden and beautiful terraces and stone monuments with extravagant names scattered around the stunning 19th century Grade One listed gardens. Also on hand is Park Farm which contains an agricultural museum a working mill and a rare breeds centre. There are stores in Great haywood. After the lock turn left at Great Haywood Junction onto the Staffordshire & Worcestershire canal. You soon come into Tixall Wide, which resembles a lake rather than a canal. To the north is the extraordinary Tixall Gatehouse , this massive 4 storey Elizabethan building dates from 1598 and is all that is left of Tixall hall. To the south is Shugborough Hall and the park surrounding it. At Milford there is good farm shop south of bridge 105. Your crew should always be at the ready on this canal, as the locks come at regular intervals! Stafford is well worth visiting as there is a lot of fine old buildings including the City Hall complex of Italianate buildings dating from 1880. There is also a robust looking gaol and there are some very pretty back alleys. The canal continues along the Canal until it reaches the relatively old village of Penkridge, and you can moor up above the lock. There is a Pub canalside by the lock, and a few pubs and stores and a bank in the village. At Filance bridge 84 there is a useful Spar shop 100 yards north on the estate. Gailey Lock is approached directly as you go under the A51, look out for the large round toll keepers watch tower , there is now a canal shop selling gifts on the bottom floor. ½ mile east of Gailey Wharf is the Gailey & Calf Heath reservoirs which are now nature reserves, and ½ west is the Spread Eagle- a large road house serving real ale & food. It is a good place to moor up for the night. It is 8 hours cruising to here. The canal is very twisting which shows its considerable age, you soon pass Calf Heath Marina near Hatherton branch Junction. There is a restaurant serving reasonable priced food in the marina. You soon reach the outskirts of Wolverhampton, and the junction of the Shopshire Union Canal with the Stafforshire and Worcester at Autherley. Continue on down the Staff & Worcs as you will soon reach the Aldersley Junction where you turn left onto the Birmingham navigations. 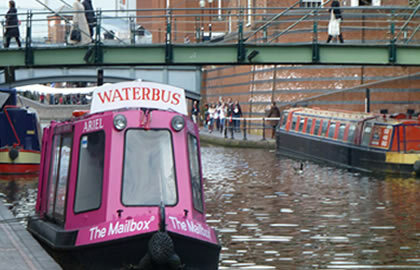 21 Locks now carry you up into the heart of Wolverhampton so your crew are going to keep fit today! Dunstall Park racecourse is passed on the right. After the last lock you can moor up in the broad Street basin, as there are useful water and refuse points. It is also not far into the centre of Wolverhampton. It is 9 hours cruising to here. The cruise today will take you to the Black Country Museum, right through Birmingham. Continue down the main line of the Birmingham canal, ignoring the left turn up the Wyrley & Essington Canal, and later on the Wednesbury oak Loop also on your left. After the short Coseley Tunnel you will see a canal leading off to your right which you should take towards Dudley and the Black Country Museum. It is worth mooring up near this superb 26 acre outdoor Museum which has been built around a re-constructed canal village, with a pub, shops and an inland port. You can ride on a trolley bus or tram, try sweet making , metal working or glass cutting, experience an underground coal mine & meet the characters in the shops and houses. It is 3 hours cruising to here, so plenty of time to explore the fantastic Outdoor living museum. Turn right along the Wolverhampton level canal, it is lock free for a while now, ignore the right turning at Oldbury Junction, and turn right at the Spon Lane Junction. There are 3 locks at Smethwick, but after these it is lock free again. Keep on the Birmingham main line towards the Gas Street basin which is where you will join the Worcester & Birmingham Canal again on your way back to Alvechurch. If you didn't have time to explore Birmingham on your way, then now's the time to get your wallet out.! There are a huge number of shops and of course you cannot miss the jewellery quarter. Plus for the kids there is the Sealife centre opposite Cambrian Wharf. It is 5 hours cruising to here. Retrace your steps back to Alvechurch marina which should take about 5 hours. If on a 14 day trip then take it more leisurely, or allow one day for Drayton Manor Theme park, and one day for a visit to Shugborough Hall, plus time for Cadbury World, the Sealife Centre, and the Snowdome, also the cathedral town of Lichfield, or Stafford with its fine old buildings, or Kingsbury water Park.